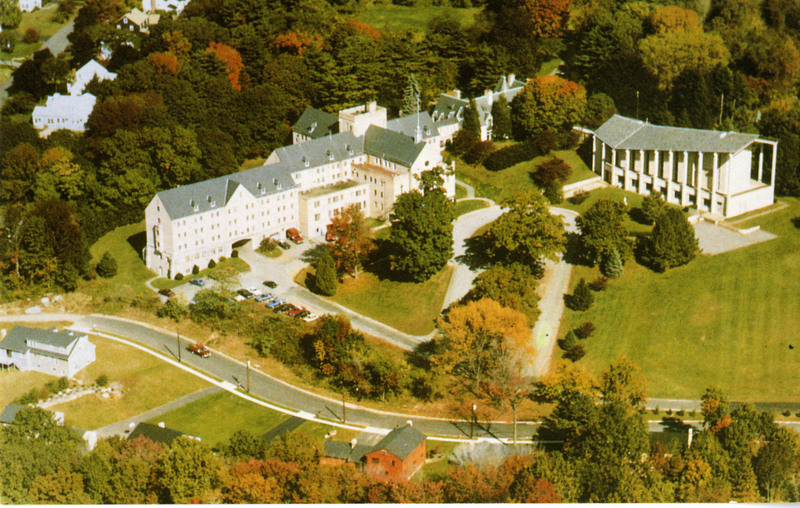 Description Aerial view of the convent of the Sisters of Notre Dame de Namur. Originally owned by John Fox, the former owner of the Boston Post, this 13-acre land includes Julie Hall (built in 1959), the Main Building (1964), the Estate House (1930) and Christ the King Chapel (1965). In 1989, with the help of a generous gift from Charles and Helen Dolan, Fairfield University purchased the property and renamed it the Dolan Campus. This campus has been home to many university departments, including the Health Center, University College, Human Resources, Computing and Network Services, the Ignatian Center for Spirituality, as well as a dormitory. Notes The Sisters of Notre Dame de Namur were founded at Amiens, France in 1804 by Saint Julie Billiart and Marie-Louise-Francoise Blin de Bourdon, Countess of Gezaincourt. They are a Roman Catholic order of religious sisters dedicated to providing assistance and education to underprivileged communities all over the world. On April 22, 2007, the chapel lounge in Dolan Hall was renamed the Sister Julie Billiart Common Room in honor of the sisters during a special mass dedication presided over by Rev. Charles Allen, S.J. Original Format Postcard; color; 3 1/2 in X 5 1/2 in.